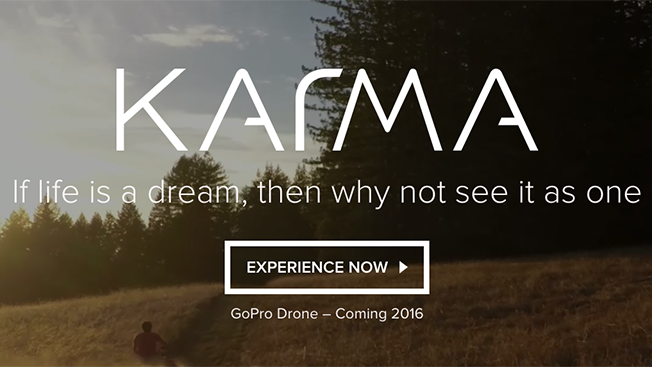 GoPro recently said it will debut its first drone in early 2016, and now the company has announced the brand name—Karma. On Wednesday, the company made the revelation by pushing a one-minute YouTube teaser. The video is a cut-up of the unbranded two-minute clip that GoPro uploaded to the video site on Oct. 28, when it originally disclosed its latest hardware. The longer spot has garnered nearly 4 million views since then. There's not much information about the drone—in terms of what it looks like or how much it will cost—in the video or on its dedicated website. But developing and marketing the product makes a lot of sense since so many GoPro enthusiasts have been attaching the high-def camcorders to drones made by other hardware companies. There are literally thousands of videos from such productions on YouTube. Indeed, if you are a GoPro investor, Karma should probably give you positive energy. And such good mojo is much needed, as Wall Street recently soured on the company after the GoPro Hero4 Session mini camera fell short of expectations.